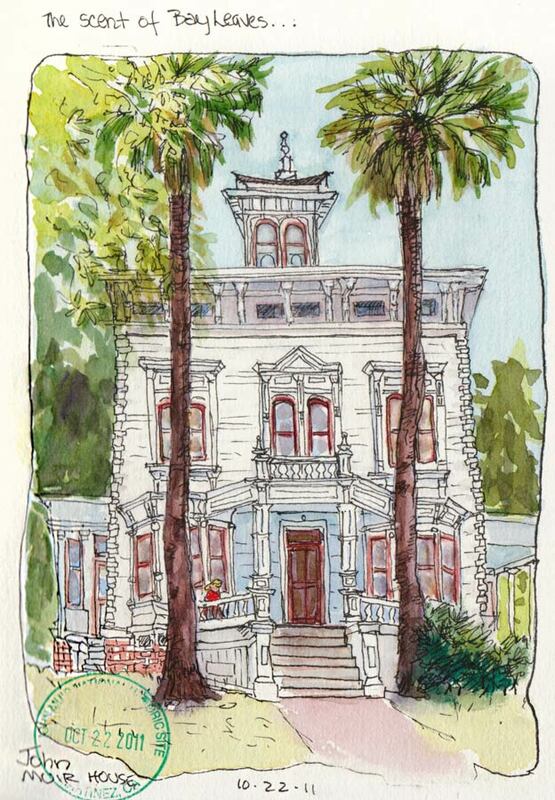 John Muir House, ink & watercolor, 7x5"
The scent of bay leaves perfumed the air as I sketched the John Muir House in Martinez. I love details and although I hear often that “good” art demands simplifying, I give myself a treat and break that rule whenever I please. I intentionally drew the house with the top smaller than the bottom because that’s how it appeared to me, sitting close and looking up. Later I realized the palm trees also appeared to tilt in towards each other at the top. Drawn parallel, they make it look like the house is tilting back away from them. Oops. I took a break between drawing and painting to explore the house and climb up to the attic lookout/bell tower. The view from there incongruously includes not only the lovely grounds with fruit tree orchards and gardens, but also the nearby freeway. You can see my friend Cathy’s sketches of the John Muir property (and the freeway) on our Urban Sketchers blog here. I am in awe of anyone who would attempt such a complicated subject!!! And do it in a recognizable fashion!!! 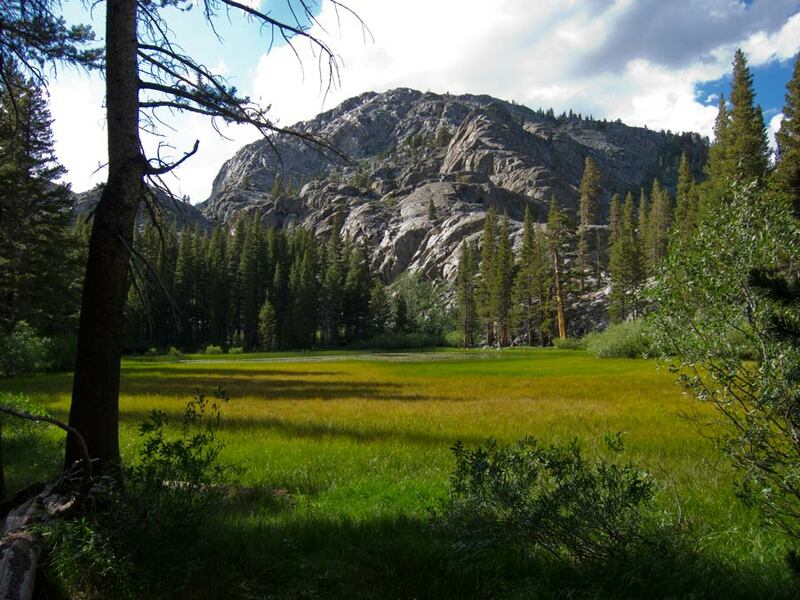 My husband and I hiked the John Muir Trail one summer….it’s probably one of the highlights of my life. I was a lot younger then!!! Loved your son’s pictures…. Hi Carol, That’s neat to hear how hiking the trail was a life highlight. It sure takes a lot of strength and energy. It seems like they just went straight uphill for miles and miles. I think they did 9 to 10 miles per day through extremely rugged terrain. It was interesting to see the lovely results others in our group got by simplifying to the point of making it a big box. But I was happy to endlessly diddle with details. Love the sketch. I’ve been to Muir Woods, but didn’t know anything about this house! Wow, Jana, I had no idea that JM had a big house in a city. And I wholeheartedly disagree with the maxim that ” ‘good’ art demands simplifying”. I LOVE detail. This is wonderful – give yourself a break more often and go for the details! Why is there a postmark on the piece? The house of course wasn’t in a city when he lived there. It was farm land and it still isn’t really in a city, it’s still a countrified area in the suburbs in Martinez. The “postmark” is actually a rubber stamp available in most national and regional parks that you can use like a passport stamp to mark your journal or other docs to show the date you were there. Actually dogs are allowed on many parts of the John Muir trail. I was sure that was all worked out properly since they do register with the rangers and plan well in advance but just to be sure I googled it and found several websites that explained where they’re allowed offleash and where they need to be on leash, but they are indeed allowed where they were hiking with her. Dogs are allowed on non-National Park trails. The JMT is 220 miles and over 90 miles of that is in Wilderness Areas–non-National Parks. We did a large stretch where we remained in different Wilderness Areas–Ansel Adams and John Muir Wilderness to name a few. Oooh, lovely! And so detailed. Looks like a fun place to explore. Beautiful sketch, Jana. Great detail and color — and I love the perspective and proportions, despite what you say.